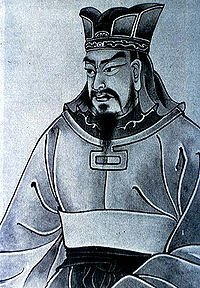 Sun Tzu (commonly: "Sun Tzu", 孙子, simplified characters; in modern Chinese, the same characters also mean "grandson" with a toneless second syllable) (c. 400 B.C.) was the author of The Art of War, a classic Chinese treatise on military strategy. Sun Tzu's strategies and tactics utilize the "Eastern tradition of strategy that emphasizes outwitting an opponent through speed, stealth, flexibility, and a minimum of effort." "Force him to reveal himself, so as to find out his vulnerable spots." "He will win who, prepared himself, waits to take the enemy unprepared." "The good fighters of old first put themselves beyond the possibility of defeat, and then waited for an opportunity of defeating the enemy." "Invincibility lies in the defense; the possibility of victory in the attack." "Move not unless you see an advantage; use not your troops unless there is something to be gained; fight not unless the position is critical." "Be extremely subtle, even to the point of formlessness. Be extremely mysterious, even to the point of soundlessness. Thereby you can be the director of the opponent's fate." (An alternative translation: "Subtle and insubstantial, the expert leaves no trace; divinely mysterious, he is inaudible. Thus, he is master of his enemy's fate."). "The control of a large force is the same principle as the control of a few men: it is merely a question of dividing up their numbers." "Fighting with a large army under your command is nowise different from fighting with a small one: it is merely a question of instituting signs and signals." "And therefore those skilled in war bring the enemy to the field of battle and are not brought there by him." "Speed is the essence of war. Take advantage of the enemy's unpreparedness; travel by unexpected routes and strike him where he has taken no precautions." "Hold out baits to entice the enemy. Feign disorder, and crush him." "...when we are able to attack, we must seem unable; when using our forces, we must appear inactive; when we are near, we must make the enemy believe we are far away; when far away, we must make him believe we are near." "Secret operations are essential in war; upon them the army relies to make its every move." "What is essential in war is victory, not prolonged operations." "In all fighting, the direct method may be used for joining battle, but indirect methods will be needed in order to secure victory. In battle, there are not more than two methods of attack – the direct and the indirect; yet these two in combination give rise to an endless series of maneuvers. The direct and the indirect lead on to each other in turn. It is like moving in a circle – you never come to an end. Who can exhaust the possibilities of their combination?" "Indirect tactics, efficiently applied, are inexhaustible as Heaven and Earth, unending as the flow of rivers and streams; like the sun and moon, they end but to begin anew; like the four seasons, they pass away to return once more." "If your opponent is of choleric temperament, seek to irritate him."